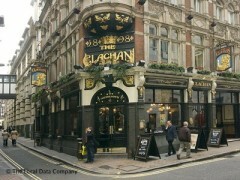 About: The Clachan was originally known as the Bricklayers and is situated behind Liberty, who once owned it. It is a Victorian pub and some of its wooden carving and ironwork still remain, as do the turret and the dome on the exterior which are typical of this period. Today, they serve a variety of beers, wines and spirits as well as an assortment of traditional pub dishes and can cater for private parties of up to 100 guests upon request. Add more details about your venue or tell us about incorrect details using these buttons.